The Drone America Airspace and Sensor Awareness System (DAAWS) provides drone operators with airspace awareness for Beyond Visual Line-of-Sight (BVLOS) flight operations. A Drone America Savant UAS is shown in flight during an extended mission beyond visual line-of-sight (BVLOS). Kongsberg Geospatial provides what we believe to be a game changing solution delivering smart situational awareness and therefore significantly improving safety. Kongsberg Geospatial, an Ottawa-based developer of geospatial visualisation software, and Drone America, who develop drones for a variety of disaster response, humanitarian relief and commercial applications, announced today that they have integrated the Kongsberg Geospatial IRIS UAS situational awareness application into Drone America’s Airspace and Sensor Awareness System (DAAWS). Drone America specializes in designing and building advanced long-range autonomous, multi-mission aircraft with modular payloads for Beyond Visual Line of Sight (BVLOS) flight operations and has developed the DAAWS system as part of their “Advanced Ground Control Station” to give flight teams the ability to manage BVLOS flight operations safely and effectively. "Professional BVLOS unmanned flight operations require the very best in equipment and technology. Kongsberg Geospatial provides what we believe to be a game changing solution delivering smart situational awareness and therefore significantly improving safety," said Mike Richards President / CEO of Drone America. Kongsberg Geospatial has been providing technology for military unmanned platforms for over a decade, and has developed a variety of sensor integration and display technologies to provide situational awareness for drone pilots operating beyond line of sight, and for monitoring airspaces for Unmanned Traffic Management, (UTM) and Counter-UAS operations. 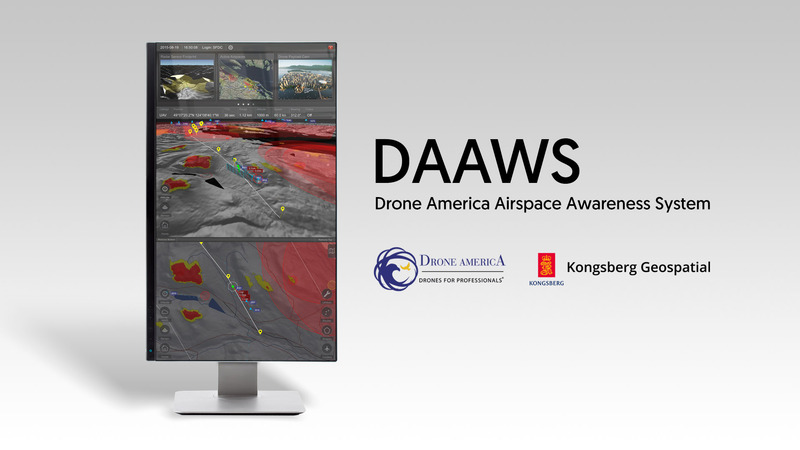 The DAAWS airspace awareness system provides commercial UAS pilots with situation awareness and an accurate picture of the airspace surrounding their Drone when operating it on long distance missions beyond their visual line-of-sight. The IRIS display technology enables multiple drones to be managed simultaneously by a single operator and provides real-time calculation of aircraft separation and communications line-of-sight to enable BVLOS operations. IRIS will provide the operator with real-time 2D and 3D visualization of airborne track and weather data, as well as geo-fencing capabilities. "We’re pleased to be working with a partner like Drone America" said Ranald McGillis, President of Kongsberg Geospatial. "This is a company that applies imagination and engineering expertise to developing creative new UAS solutions to tackle big problems like search-and-rescue, and fighting wildfires. At Kongsberg Geospatial, we’ve developed world class technology for sensor integration and airspace awareness. This provides a tremendous foundation for partnership." : image of the Drone America Airspace Awareness System, powered by Kongsberg Geospatial IRIS. : image of the Drone America Airspace Awareness System, powered by Kongsberg Geospatial IRIS.